Large, geodesic, candy-pink: at first appearance Future Method Studio’s Buckminster Fuller-inspired dome tent, filled with white pebbles and bits of flint, is a surprising presence in a gallery show about Australia’s long paddock. That phrase—long paddock—is a colloquialism, a settler-colonial buzzword for the travelling stock routes (TSRs) that once traversed and now patchwork the continent. Joni Taylor from the New Landscapes Institute has curated a show situated at the intersection of architecture and art that explores the layered histories of the TSRs at a time when access to public land is more contentious than ever. The exhibition is the first iteration of a long-term project engaging with the uncertain future of this important public resource. Classified as crown land, today TSRs are liminal zones used for myriad purposes. Farmers, birdwatchers, beekeepers, bushwalkers, ecologists and traditional owners all have a stake in their future. Up on the gallery wall, near the dome, Future Method Studio has created a map that charts the locations across NSW where the TSRs intersect with places of Aboriginal significance. It’s an impressively detailed and important document and to my knowledge no other map like it exists. As the artists in this show acutely understand, the problem with maps is that they formalise a kind of forgetting. By prioritising one set of concerns, others fade away. Living and working in the Riverina, The Wired Lab (see a 2014 RealTime TV interview with director Sarah Last), are particularly sensitive to this, using two different maps, one historical, one spatial, to contextualise a mesmerising soundscape featuring local activist Peter Beath speaking in Wiradjuri—a language declared extinct in 2007 but which in fact survives—and field recordings from TSRs local to the area, a lively racket of cicadas, birds and insects. It’s The Wired Lab work, Lines of movement, a Wiradjuri history, that feels the most essential; human and non-human occupants are given equal ground from which to speak. Looking at the TSRs from an economic perspective led artist Zanny Begg to the bullwhip effect, an economic term that describes accelerating unpredictability within complex supply chains. The bullwhip is also a uniquely Australian whip and the first human invention with the capacity to break the sound barrier. 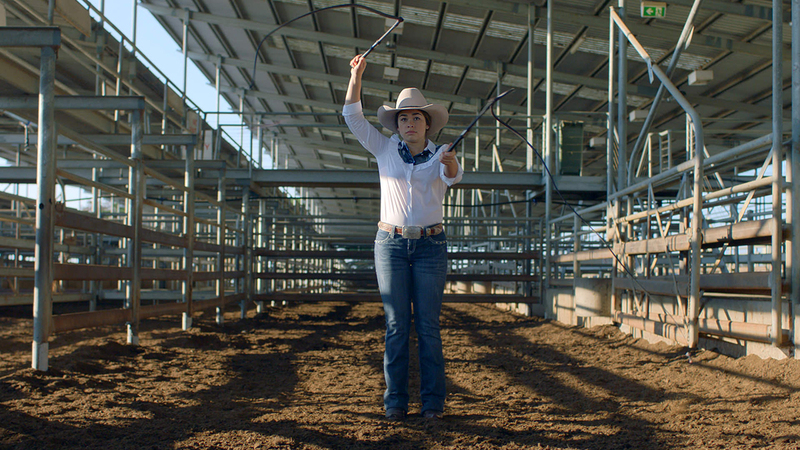 Begg’s film, The Bullwhip Effect, features a virtuosic demonstration by 17-year-old Emiliqua East, one of the world’s best whipcrackers. Slowed down to 200 frames per second, she becomes a medusa-like figure, totally focused, barely blinking, two whips writhing and cracking around her with stunning precision. Shot and soundtracked in a manner that playfully engages Western genre tropes, East enters and exits the film walking slowly through a labyrinthine, stainless steel cattleyard. In Untitled Incognito, Megan Cope and Bill Buckley present a reworked version of an Aboriginal windbreak made from a mix of traditional and non-traditional materials. Its ochre-painted surface is used as a screen, onto which two images are overlaid: rippling water from the Murrumbidgee and a map of local TSR coordinates. The work asks important questions about who the TSRs are for, and what they might become. As of April the NSW TSRs have been placed under formal review. What if this land were to be repatriated to traditional owners? Architecture collective Grandeza offers a global perspective in The Plant, presenting a case study on similar stock routes throughout Spain. 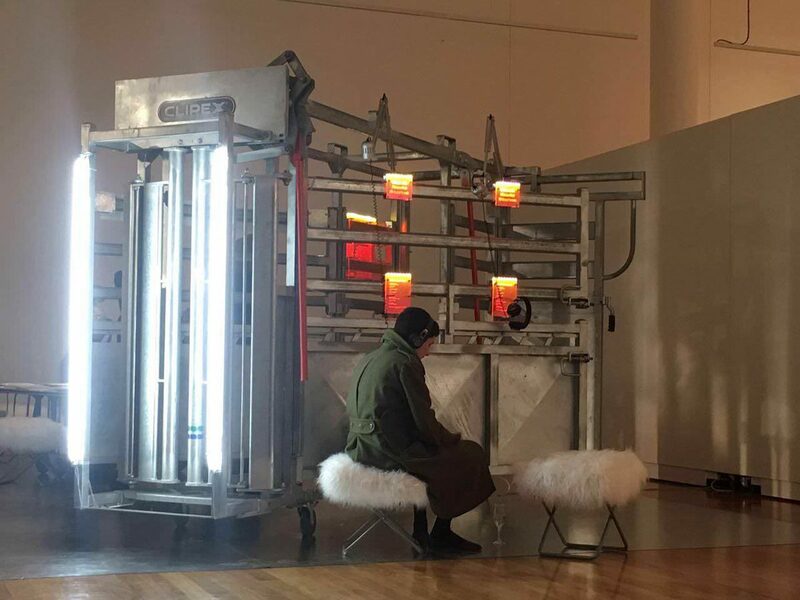 Alongside this, they have created a portable conversation arena and an adapted version of the cattle crush (a holding stall), programmed with recordings from members of the community telling their stories about the TSRs. The architectural contributions of both Grandeza and Future Method Studio bring a sense of public agency into the gallery and activate the exhibition as a site of political action. Back to the dome, which on closer inspection represents the concept of “a keeping place” — a place where Aboriginal cultural materials are held safely. Setting aside places as symbolic space where Aboriginal systems can be honoured is a concept that has been written into bureaucratic systems; for example, there are keeping places held on-site at mining locations where artefacts have been incidentally dug up. Cultural items are stored temporarily and then repatriated once the land is no longer being used. In Future Method Studio’s Future Acts, the keeping place marks an important moment in their research. 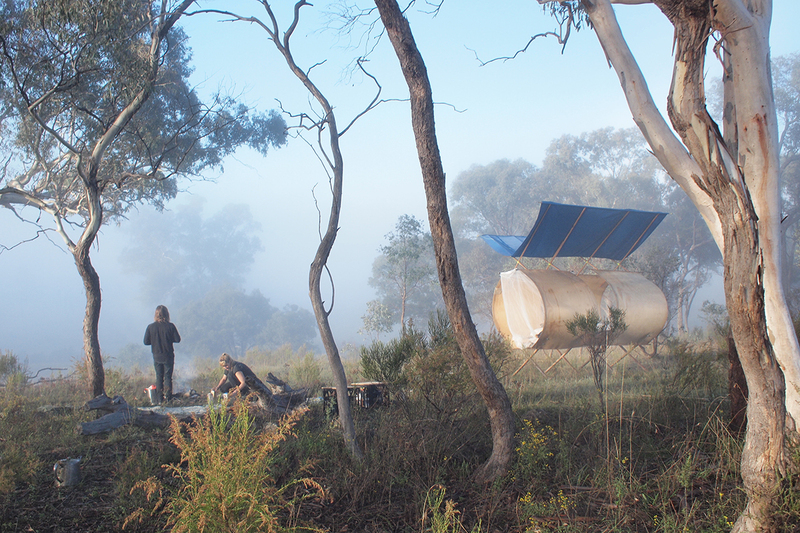 While they were at a stock route location, artists from the Studio and their Aboriginal collaborators came across a significant number of Aboriginal artefacts sitting in the topsoil. The experience resonated in two ways: it showed just how twinned the relatively recent history of the stock routes is with the long history of Aboriginal land custodianship. And it showed just how bad whitefellas have been at seeing what’s in front of them. The pink dome, a shape that recalls the activist politics of the US counterculture movement, operates recursively, as aura and totem. Presenting and representing the concept of keeping place, a warm ethics of care washes over the gallery as a whole. Emily Stewart is poetry editor at Giramondo Publishing and a doctoral student in the Writing and Society Research Centre at WSU. She is the author of Knocks (Vagabond Press 2016).